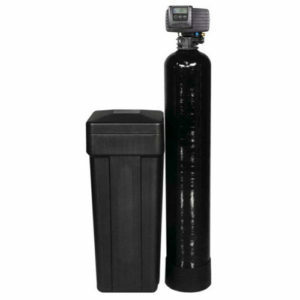 The capacity of a water softener is simply the amount of hardness it can remove before it needs to regenerate. Water softener capacity is one of the most poorly understood aspects of water softener sizing by both dealers and consumers alike. There is a great deal of misinformation regarding capacity, and most of the water softeners advertised for sale on the internet or elsewhere are often inaccurate or misleading when it comes to softener capacity. The internet is littered with websites selling 24,000 / 32,000 / 48,000 / 64,000 grain water softeners. What does this mean? As mentioned above, the capacity of a water softener describes how much hardness it can remove before it needs to regenerate. A “grain” of hardness is 1/7000th of a pound of dissolved calcium and magnesium. A water softener advertised as a “32,000” grain system should be able to remove 32,000 grains of hardness before it requires regeneration, right? There are, however, two aspects of this statement that are misleading. What is sold typically as a 32,000 grain system contains 1 cubic foot of water softening resin. If one looks at the specification provided by the resin manufacturer you will see that 1 cubic foot of resin under ideal laboratory conditions can remove about 32,000 grains of hardness. But ideal lab conditions use carefully controlled flow rates, water temperature, water pressure, etc. These conditions are never met in the real world. So, the true maximum softening capacity of 1 cubic foot of resin is perhaps 30,000, and probably a little less. But more misleading than the maximum laboratory capacity, is the amount of salt required during backwash to achieve the maximum capacity. One cubic foot of resin requires between 18 pounds of salt to achieve 30,000 grains of recovered capacity! This is a statistic not mentioned by most dealers. It may be possible to achieve 30,000 grains of recovered capacity with 1 cubic foot of resin but it will be very costly in terms of dollars and the environment to use 18 pounds of salt during every regeneration cycle. A softener regenerating once a week at 18 pounds of salt per regeneration will use almost 1000 pounds of salt in a year! That is a staggering amount. What is very interesting, is that the same 1 cubic foot of resin can be regenerated with 6 pounds of salt and this will yield 20,000 grains of recovered softening capacity – one third of the amount of salt yields two thirds of the maximum capacity. This is a much more efficient way to operate a water softener. Less salt means fewer dollars spent, fewer trips to the salt store, less salt to lug, and less salt discharged to the septic system and the environment. But beware – not all water softeners can be set up in this high efficiency mode. The consumer programs the softener as a 32,000 grain system but only programs it to use 6 pounds of salt per regeneration. In this case the softener will only remove about 20,000 grains of hardness but the softener will think it has 12,000 grains of capacity remaining and will not initiate a regeneration for several days. The result is that the softener provides soft water for a few days and then provides un-softened water for a few days before regenerating. The consumer realizes upon receiving the softener and reading the manual that it will take 18 pounds of salt to get 30,000 grains of capacity from the system. The consumer programs the softener to use 18 pounds of salt per regeneration and ends up spending much more money on salt than anticipated. The consumer realizes upon receiving the softener that the most efficient settings are to use 6 pounds of salt per regeneration and to set the system capacity to 20,000 grains. In this case, the softener will regenerate more frequently than anticipated and this creates extra wear and tear on the valve mechanism. This probably results in premature repair/maintenance costs and inconvenience. The only accurate way to describe water softener capacity is by cubic feet of resin and how much salt it will take per regeneration to achieve the stated capacity. In some U.S. and Canadian jurisdictions a water softener manufacturer must state the salt efficiency of the system being sold. The efficiency is stated in grains/pound of salt. This is the most accurate, honest, and direct way to describe a water softener. Rather than showing the consumer a make-believe capacity that can only be achieved in a laboratory or with massive amounts of salt, the efficiency shows how much salt will be used and how much softening capacity will result. Despite this concept being around for a long time there are many, many dealers – both online and in-store – who do not understand this concept or refuse to accept its validity. But rest assured that the salt use data provided by resin manufacturers doesn’t lie. When you’re deciding where to buy your softener, look for a dealer that understands this concept and can help you select a water softener that will minimize salt use and maximize your satisfaction.